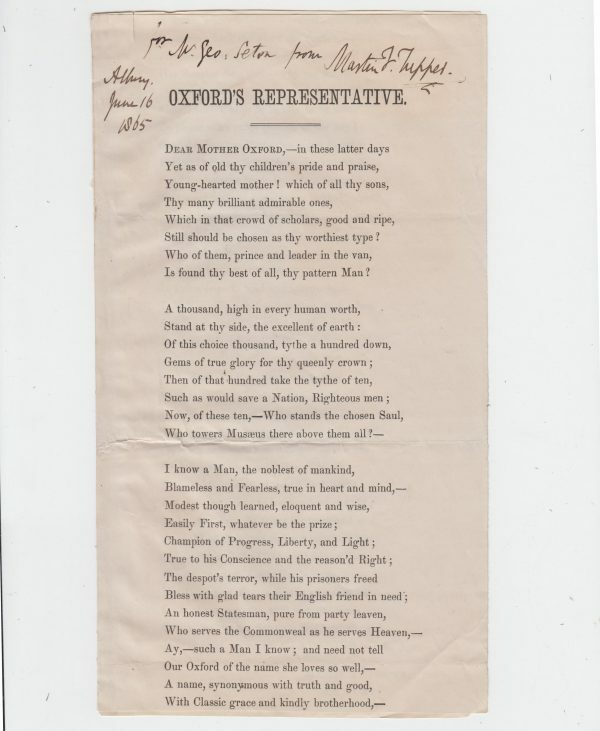 Oxford’s Representative. Printed Verses on 2 pp. 10 x 5 inches. Inscribed by the author to Mr. Geo. Seton. Albury, 16 June 1865. Martin Farquhar Tupper (1810-89) achieved incredible success with his Proverbial Philosophy, which sold never less than 5000 copies per year in England for 25 years. This phenomenon gained him savage parodies in the literary world, such as by C.L.Dodgson in The New Belfry of Christ Church (1872).